For millennia, in some parts of Asia, the only way to climb the socioeconomic ladder and find secure work was to take an examination — in which the proctor was a proxy for the emperor, says Marc Tucker, president and CEO of the National Center on Education and the Economy. Those examinations required a thorough command of knowledge, and taking them was a grueling rite of passage. Today, many in the Confucian countries still respect the kind of educational achievement that is promoted by an exam culture. The Koreans have achieved a remarkable feat: the country is 100 percent literate. But success comes with a price. Among these countries, South Korea stands apart as the most extreme, and arguably, most successful. 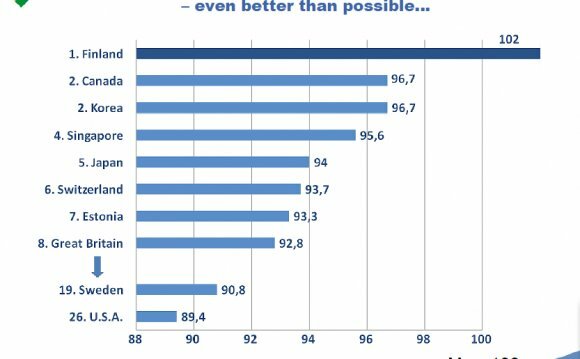 The Koreans have achieved a remarkable feat: the country is 100 percent literate, and at the forefront of international comparative tests of achievement, including tests of critical thinking and analysis. But this success comes with a price: Students are under enormous, unrelenting pressure to perform. Talent is not a consideration — because the culture believes in hard work and diligence above all, there is no excuse for failure. Children study year-round, both in-school and with tutors. If you study hard enough, you can be smart enough. “Koreans basically believe that I have to get through this really tough period to have a great future, ” says Andreas Schleicher, director of education and skills at PISA and special advisor on education policy at the OECD. “It’s a question of short-term unhappiness and long-term happiness.” It’s not just the parents pressuring their kids. Because this culture traditionally celebrates conformity and order, pressure from other students can also heighten performance expectations. This community attitude expresses itself even in early-childhood education, says Joe Tobin, professor of early childhood education at the University of Georgia who specializes in comparative international research. In Korea, as in other Asian countries, class sizes are very large — which would be extremely undesirable for, say, an American parent. But in Korea, the goal is for the teacher to lead the class as a community, and for peer relationships to develop. In American preschools, the focus for teachers is on developing individual relationships with students, and intervening regularly in peer relationships. The Finnish model: Extracurricular choice, intrinsic motivation. In Finland, on the other hand, students are learning the benefits of both rigor and flexibility. The Finnish model, say educators, is utopia. Finland has a short school day rich with school-sponsored extracurriculars, because Finns believe important learning happens outside the classroom. In Finland, school is the center of the community, notes Schleicher. School provides not just educational services, but social services. Education is about creating identity. Which Type of Education Is Best?